The map shows two proposed sites for a new school for the town of Canterbury and the surrounding area. The first site (S1) is situated in the countryside, to the north-east of the town centre. It is just outside the main housing area of the town and not far from the main road that links Sturry with Canterbury. 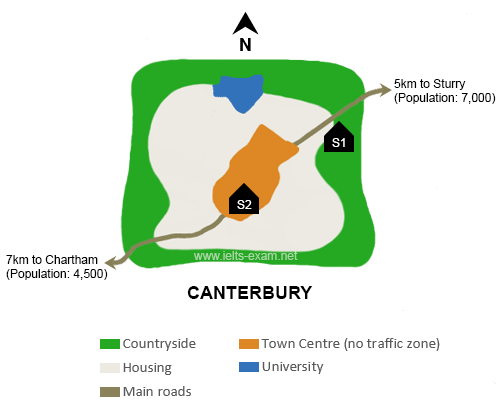 It would therefore probably be in an ideal location for students coming from Sturry, which is only 5 kilometres away, and those who live on the east side of Canterbury. If there are students coming from Chartham, which is 7 kilometres to the south-west, they would be able to reach the school by taking the main road that runs south-west of Canterbury. The second site (S2) is located in the town centre itself. There are advantages of this: it makes it practically equidistant for students coming from either Sturry or Chartham. Moreover, it would presumably be relatively easy for students who live in the housing area around the town centre to reach the school. However, because of the no traffic zone in the town centre, no parent would be able to drive their child all the way to school. This may make travel arrangements difficult for some parents. It is important to use paragraphs in your Writing Task 1 answer. Paragraphs show that your answer is well organised.